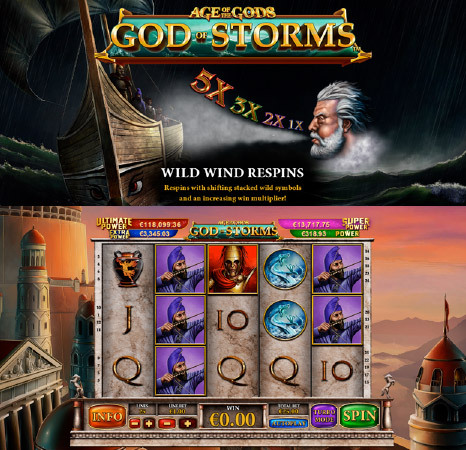 Fly Casino is pleased to present Age of the Gods – God of Storms! This amazing new slot game now playing at Fly Casino is the seventh game of the massively popular Age of the Gods slot series. When you play this 5-reel, 25-line game, you will immerse yourself into another world of mystery and power. The best bonus feature is the Wild Wind Re-spins. Get a stacked wild ship and a Greek God appears to blow the wild ship one reel to left after each free re-spin. After each of his godly blows, he’ll increase a multiplier for you to win more and more. These start at 1X before increasing to 2X, 3X and up to 5X. As you may already know, all of the Age of the Gods games are linked to the huge four-level progressive system whereby you can randomly win any of the progressive jackpots after each spin. $150.00 Super Value Sunday! On Sunday from 00:00GMT until 23:59 GMT, all members will receive a 100% bonus up to 150.00 on your deposits of JUST $/£/€10 or more. 10 Gets 10 X 10. From 00:00GMT until 23:59 GMT, all members on their deposit of just $/£/€10 or more will receive $/£/€10 bonus. You can claim this bonus 10X!